On day one, No. 10 Abul Hasan had scored a debut hundred in a session in a partnership of 172 in 30 overs with Mahmudullah. On day two, Marlon Samuels scored his third Test century in 2012 in a partnership of 198 in 69.2 overs with Darren Bravo, who was 15 shy of his fourth. The difference, apart from the pace of scoring, was that West Indies still had eight wickets remaining. Samuels and Bravo refused to give their wickets away, and Bangladesh could not produce enough bite out of the placid Khulna pitch to dislodge them. The slow surface continued to provide neither seam nor troublesome spin, though there was some reverse-swing. All that was required of Samuels and Bravo was to not get themselves out like Chris Gayle and Kieran Powell had in the morning. They did just that, batting cautiously but solidly for more than two sessions. The post-lunch session brought 84 runs in 30 overs and 95 came in 31 overs after tea. Shakib Al Hasan, who once again bowled the most overs for Bangladesh, did manage to bother Samuels to some extent. Shakib kept Samuels largely defensive with deliveries angled into the batsman. Samuels was struck on the pads a few times but with Shakib bowling from wide of the crease and there being hardly any turn, Bangladesh's appeals were turned down. While they had no success against Samuels and Bravo, Bangladesh did not falter much in their lines. There were two periods when West Indies went without a boundary for more than ten overs. Bravo broke the first drought with a thick-edged drive past gully off Abul Hasan, and Samuels ended the next one with successive boundaries off Rubel Hossain. With the ball getting older, Rubel and the debutant centurion Abul Hasan found movement which had been absent earlier. 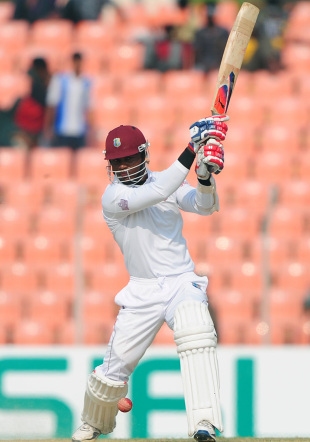 The batsmen, especially Samuels, were beaten a few times, but regained their focus soon. With sweeper cover and wide long-off in place, Samuels scythed Shakib to the deep-extra cover rope to get to his century off the last delivery with the old ball. Bangladesh took the new ball immediately, but they got just two overs with it, and both were bowled by the spinners. Samuels hit a four in each over to make end the visitors' day on a high, which had not seemed probable when the West Indies openers had fallen cheaply. It was Rubel who had conjured a wicket out of nothing in the morning. Gayle and Powell had only themselves to blame for failing to score big on a featherbed. The West Indies openers had been almost casually hitting boundaries till the first delivery of the tenth over, when Rubel hit Powell in the back of the head with a bouncer. The batsman received treatment, and promptly swung at and missed the next delivery, also short. The fifth was short again, and Powell pulled it straight to the deep square leg fielder. At the other end, the offspinner Sohag Gazi, who had opened the bowling again, was trying to tempt Gayle with innocuous flighted deliveries with long-off waiting. Gayle, clearly wanting to avoid missing out on big runs, was defending sedately. When Gazi sent one towards the pads, Gayle immediately went for the sweep, and under-edged it to the wicketkeeper. West Indies had needed just 31 deliveries in the morning to remove Abul and Mahmudullah. Mahmudullah was the first to go, having added just four runs to his overnight 72, as he checked his drive for the bowler, Darren Sammy, to take the catch. The stand between Mahmudullah and Abul ended on 184, making it the third-highest ever for the ninth wicket, and also the fifth-highest for Bangladesh. Abul went past Reggie Duff for the highest individual innings by a debutant No. 10 batsman. There was a loud cheer from the Khulna crowd when he defended his first delivery of the day quite solidly. He had time to charge and smash Sammy down the ground for four before Fidel Edwards had him fending a catch to the slip cordon off his glove. It was Edwards' sixth wicket, the third time he has done so in 55 Tests. Bangladesh tried hard, but they did not come remotely close to getting what Edwards had squeezed out of the pitch.